A search of runaway slave advertisements in newspapers yields a small sample of 31 cases of runaway slaves associated with the canal in some manner from 1829—1860. Twenty-seven of the ads were published during the early construction period of the canal's history, from 1829—1839. In the case of twelve runaways, it is explicitly written that the escapees had at one time been, or were actively engaged in, working on the canal. Interestingly, Sanderlin also writes that because of the difficulty that the canal company had with indentured servants, its board of directors refused to purchase slaves. (7) Therefore, any slaves who worked on the waterway must have been hired out by their owners to contractors that the company engaged to do work on the canal. Based on the runaway slave ads, it can be concluded that the canal company utilized slave labor indirectly by hiring contractors who employed slaves. In all the cases of runaway slaves, the escapees were males. The physical demands of flight, lack of child rearing responsibilities, and more relative freedom of movement may help explain why all of the fugitives were men. The sample also illustrates that running away was usually a young man's activity. Six runaways were under the age of 20 (the youngest was sixteen); sixteen of the escapees were between age 20 and 29; four from age 30 to 39; two between 40 and 49; and one was 60year old. Two ads provided no age. The canal company lodged workers near the line of the canal, which may have made escape particularly tempting, given its relative remoteness from population centers. From an analysis of these data, two significant findings come to light: 1) that to some extent, slave labor was indeed utilized on the canal; and 2) that slaves sometimes fled to the canal to find work, which provided more relative freedom, including an opportunity to earn money. Still, the runaway slave ads leave unanswered at least one important question: was the canal a part of an organized network—the Underground Railroad—to aid a slave's escape, as written in the B&O Railroad brochure? The small number of the runaway slave ads limits the conclusions that can be drawn. If runaway slave ads from additional newspapers along the line of the canal—especially those in print just prior to the Civil War—can be added to those obtained from the collection at the Maryland State Archives, a more complete picture of the canal's role in the Underground Railroad will come into focus. 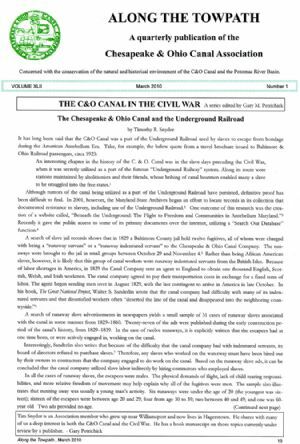 In the absence of memoirs or other first person accounts, however, we may never have a complete picture of the canal's role in the veiled Underground Railroad. 1. Along the Picturesque Potomac on the Baltimore & Ohio (n.p., c1923) 11-12. 6. Walter S. Sanderlin, The Great National Project: A History of the Chesapeake and Ohio Canal (Baltimore: Johns Hopkins Press, 1946), 71-74, 76. 10. Ibid, Feb. 24, 1830, "Beneath the Underground," http://www.mdslavery.net/"
This article was published in the C&O Canal Association's newsletter, Along the Towpath and is used with permission.